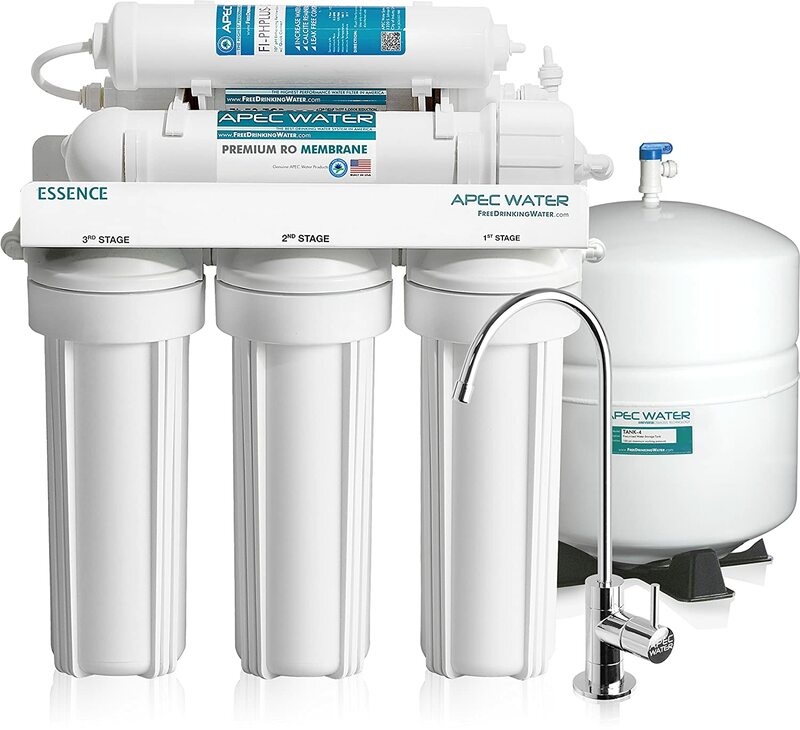 The APEC ROES-PH75 from APEC Water Systems is a ground-breaking, 100% US-made, NSF certified reverse osmosis drinking water system that redefines the way you drink water. The cartridge guarantees a proven safe pH enrichment so you can you can relish ultra-pure, great tasting water with improved alkalinity fortified with calcium minerals. Up to 99% of viruses, bacteria, organics, cysts, chemicals, etc. are removed by the 75 GPD 6-stage system. Now you can have an unlimited supply of drinking water produced by the first-class, high quality filters. The APEC ROES-PH75 is truly a seamless, high performance system under a top rated US brand, also popular for their excellent support and warranty. The APEC ROES-PH75 showcases the innovative reverse osmosis drinking water system that makes a once “unsafe” water to a safe and absolute one. It utilizes a 6-stage water purifying system that is modernly designed to remove all unwanted elements leaving a great tasting water in its cleanest and healthiest state! 2nd & 3rd stage – chemicals (e.g. VOCs), along with the foul tastes, color, odor, cloudiness, and chlorine are ALL eliminated. 6th stage – increasing of water alkalinity takes place by adding calcium carbonate. Enjoy the finest drink in America. With APEC, you get to enjoy the most premium drinking system in the US! For 17 years in the industry, APEC has built a reliable name with a reputable standing and has provided trouble-free satisfaction since the day it was founded. They continue to strive for water perfection at the present time, and to the years to come. With APEC, you are guaranteed to have the best water that has undergone a high quality water system and one hundred percent made in America! This system produces a drinking water that promotes the possibility of living healthier and longer! Up to 99% of harmful contaminants are removed from well and tap water, leaving you an ultra-safe and ultra-pure water to consume – thanks to reverse osmosis method done seamlessly with this system. Using the APEC ROES-PH75 gives you consistent savings from the first weeks of use and tremendous savings in the long run! Based on that initial computation, and supposing you consume at least 3 gallons per day, the total gallons you drink annually would be 1,095 gallons. Thus, you save $1029 per year! Imagine having an unlimited supply of ultra-fresh, purely safe, and delicious drinking water that you can consume daily. This can be made possible by the APEC Water System’s ROES-PH75. You can utilize the drinking water for different applications such as cooking, tea, coffee, baby formulas, and more uses. With APEC Water Systems, you can have an unlimited supply of water which can provide health, dietary and beauty benefits. Smart – automatically shuts off so you won’t waste any water when the tank is full. Great cartridge – 100% made in the US; utilizes food-grade calcium from reliable source. Only needs low maintenance – you only need to change 3 ULTIMATE pre-filters in an annual basis. Noise FREE Operation – promotes a quiet environment especially for noise-sensitive people. Solid and Sturdy Construction – 100% American made! Professional Technical Support that satisfies your needs. Seamless 6-stage process that ensures best water filtration for your consumption. Easy and Convenient Installation – can be done in just an hour. The first con is not about the product itself but the limit of availability. For now, Amazon ships this product only in the U.S. and to APO/FPO addresses. However, if you live in the country, you will experience no availability issues. Major issues and negative feedbacks can rarely be seen in the comment section. Instead, the product is flooded with good reviews coming from satisfied consumers and verified buyers. The only downside of this product probably is its high-end price which is undeniably higher compared to its competitors. However, with the performance and output the user can get, the price of the product becomes worth the investment. For a higher price, you also get higher quality product with a longer life expectancy bound to serve you and your family with the best it can offer. I truly feel confident drinking water from this system. My water is basically tasteless but it does feel good drinking it! The best part is I can truly tell that my water is so much cleaner than it is previously. Reverse osmosis really makes a difference! All in all, I am satisfied with my experience with this product. I truthfully recommend this one! Installing the APEC ROES-PH75 is pretty easy because each package comes with a complete set of tools required for the installation process. The package also comes with a comprehensive manual that will assist you every step of the installation through its understandable steps. However, if you are not comfortable installing the system yourself, you can call a professional plumber to do the work for you. Using the product is also relatively easy and maintenance is not extensive. If you are looking for a reverse osmosis drinking water system, then the APEC ROES-PH75 from APEC Water Systems could be the best solution for your needs. This choice can give superior drinking water that is safe, pure, and definitely healthy!